Annoyed by pesky grammar mistakes? So are we. We fixed some of those, plus lots more! For a detailed list of updates, view the changelog at the bottom of this post. Fans of multiplayer are going to love this one! Regions owned by players who disconnect during a multiplayer match can now be claimed by others. Additionally, damage status updates for Dreadnoughts, Juggernauts, and the Nexus will always play immediately so that you can respond to an attack right away. Changes in recent updates have caused us to re-evaluate some of our campaigns and how they flow. To ensure a more balanced and intuitive campaign experience, we've made several adjustments, including adding some advanced defenses to certain missions, updating grammar to fit with the voiced dialogue, granting access to certain units, pacing changes, and more. The call for more strategic diversity in our maps was loud and clear! We have made adjustments on certain playing fields that fix the proportion of Radioactives, which was previously too low. We also fixed some of those pesky spawn points and areas that were unbuildable on some maps. The v2.65 update is ready and waiting for you in your Steam client! We have updated the thumbnails for most of the Scenarios so that each one now has their own unique image, instead of having a few shared among them. We have improved the layout and appearance of the pre-benchmark screen. In 2.5, we reduced the health of the Assembly to make it weaker than the PHC Counterparts to compensate for its versatility. Since it can no longer produce air units, we are restoring some of that health. The changes to Substrate air production in 2.6 created some issues in the Escalation campaign which we are now addressing. We are also removing some outdated dialog that now provides incorrect information. We're fixing some map issues and changing a few maps that had too low a proportion of Radioactives, which limited strategic diversity. Fixed a disconnect between two regions in "Crack the Shell"
Fixed a bug where "Turtle Wars" Scenario had invulnerable turrets. Fixed a bug where pending Logistics warnings were not showing up for peers in a multiplayer game. Improved the visual weapon alignment of the Sentinel, Carving, Falcon, Serpentine, Starburst and SkyEnder turrets. 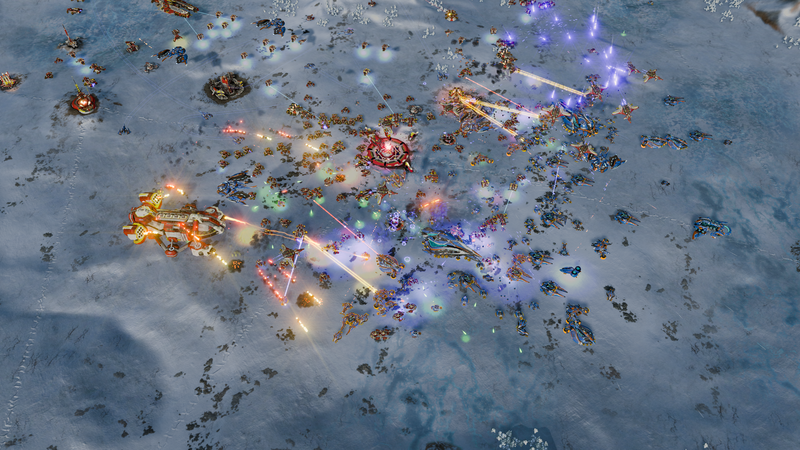 Disruptor Tower can no longer target air units.